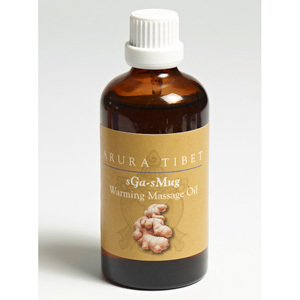 Arura Tibet sGa-sMug Warming Massage Oil is based on Tibetan medicine. Apply to skin - suitable for sore and aching joints. 	Sunflower oil ( Nyima -Metok ) - warming oil used for treating kidney disease, ringing in the ears, swelling of the limbs during antenatal periods. It contains vitamin A,B,D and E.
	Walnut oil (sTar-ga) - used in Tibetan medicine for loong diseases, kidney problems, contractures and stiffness in the limbs and joints .Walnuts grow in the Kong-po region of Tibet, walnut contains Omega 3, linoleic acid and vitamin E.
	Cypress - ( rGya- Shook ) used for urinary bladder problem, muscular aches and pains, rheumatism and varicose veins. 	Cederwood (Thang-shing ) - used for treatment of oedema of the joints, chronic arthritis and helps warm bodily extremities. 	Juniper berries ( Shuk pa - tserchen- bru ) - warming properties help elimination of uric acid, rheumatism and arthritis, strengthens the kidneys and restores vitality. 	Ginger (sGa-sMug) - helps for circulation, chilblains, chronic cold feet and reduces loong. 	Black pepper ( Na-le-sham) - very warming oil which helps digestion, cellulite and protects from colds and flu. It also relieves aches and pains. 	Lemon oil is useful for its detoxifying, rubefacient, anti-rheumatic properties and adds a piercing bright note to the blend. 	Tocopherol ( Vitamin E ) Vitamin E is an anti-oxidant, and for smooth dry and rough skin. *Lomonene, Linalool, Citral - Chemical constituents naturally occurring in the essential oils. Direction - Shake well, warm your palms, pour a little oil onto your palm and massage into all the affected areas of neck, back and joints.